Well one thing is sure – you should toss out your paperback copy of Roget and delete the bookmark to your grandpa’s thesaurus.com, because thesauri have come a long way baby, and finding new words has never been more exiting, thrilling, or exhilarating. 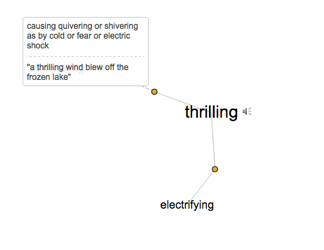 Visual Thesaurus is just like it sounds. Rather than showing up in a boring list, your search term is displayed graphically, surrounded by nodes with related thoughts attached in a tree-like, categorized structure. Looks just like a tree, plant, growth, slime mold. Click a nearby word and it zooms to center-stage. Then click the next, and so on, to spatially browse through a series of words in an intuitive process that doesn’t interrupt your flow of thought. It’s more like play than work. For convenience, it keeps a history of recent searches, and you can click and drag special words into a list to save for later. It supports multiple languages (American English, UK English, Dutch, German, Spanish, and Italian). Multiple definitions of the selected word are listed to the side or on mouse-hover, and it will pronounce the word if you click the speaker icon. 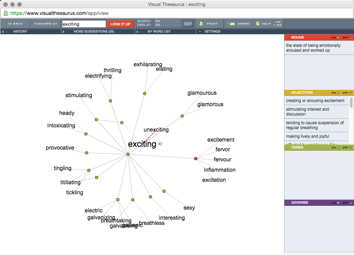 Visual Thesaurus is free for a limited number of uses and with restricted features. You can trial the full version for 14 days, after which it costs about $3 a month, or $20 a year. Results are displayed as a word cloud in alphabetical order, sized by relevance. Each synonym is clickable, which will add it to your search terms, narrowing down or expanding the results even further. This lets you really hone in on that elusive target. Its ability to search on short phrases and idioms is pretty useful, too. Cloud technology has come a long way. Moreover, Panlexicon is free. Really. I’ve tried to pay them several times, and they’ve assured me it’s a labor of love and don’t need my hard-earned coin. Which is too bad, because it is worth every penny I could be paying for it. I just hope that means it will never go away. 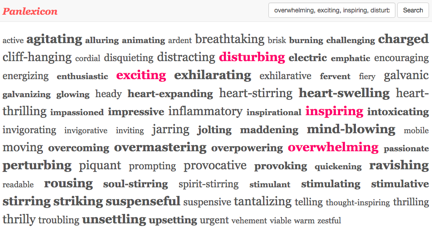 Compared to most thesauri (including Visual Thesaurus), it displays a higher number of obscure lexemes, which for fantasy and sci-fi writers is a must-have. I wish it would display archaic terms that, no really, no one uses anymore, but we can’t have everything. Sadly, it’s missing a few features I’d grown used to on Visual Thesaurus. I want it to display definitions, perhaps through a mouse-hover, though that couldn’t work on a touch screen device. And the lack of antonym results is unfortunate. 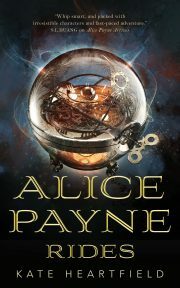 In my fantasy world, Panlexicon would leverage the untapped potential of searching by antonym. Imagine the raw power you’d wield if you could include an antonym in the search itself, like so: “engaging, magical, !lackluster” Maybe someday. Occasionally, Panlexicon completely fails to find connections between obvious associations, like last week when no combination of the words “nurturing, comforting, healing” brought up results. If this happens, be sure to try other tenses. “Nurture, comfort, heal” worked a little better. For cases like these, it would be nice if Panlexicon could crowd-source suggested connections. Or at least if, behind the scenes, it factored in commonly co-searched terms to give it some element of self-learning. Meanwhile, you now have two new choices when it comes to reference tools. Give them both a try, and I’m sure one of them will win your heart. Luna Lindsey lives in Seattle, WA. Her first story (about a hippopotamus) crawled out of her head at age 4. After running out of things to say about hippopotami, she switched to sci-fi, fantasy, and horror. Her stories have appeared in the Journal of Unlikely Entomology, Penumbra eMag, and Crossed Genres. She tweets like a bird @lunalindsey and blogs at www.lunalindsey.com. 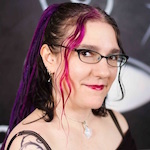 Her novel, Emerald City Dreamer, is about faeries in Seattle and the women who hunt them. Nifty! Thanks for writing these up. Visual thesaurus is the way to go, I haven’t tried the other one, but visual works well even in standalone version for over 4 years.